"Just when everything seems gray, St. Valentine's Day comes to save the day with a radical splash of RED! It is a color that I could not do without. It is the color of energy; the pulse of life. The heart, too, is a symbol of life, love and regeneration, plus a wonderful graphic reminder of our mortality." So says today's featured artist and designer, Jane Sassaman. Those who know and love her designs will recognize her distinctive style in these glorious hearts. 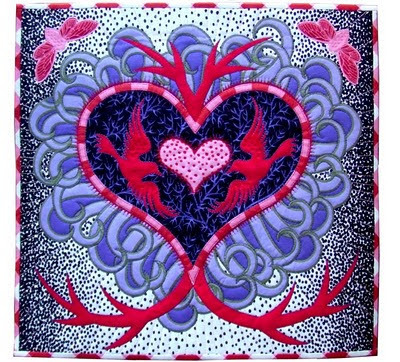 This exotic Valentine, with its appliqued heart, is based on Jane Sassaman's Bleeding Heart (available at Jane Sassaman's online shop). 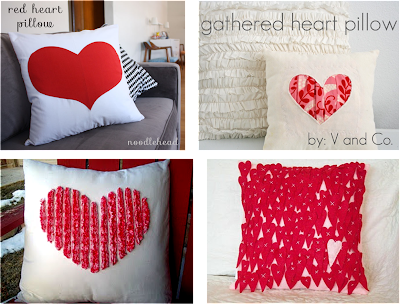 The bleeding heart is one of four different Simple Silhouette patterns inspired by Mexican folk art designs. Each 18” quilt looks quite sophisticated but is actually very fast and easy to make using only 3 pieces of fabric! Shown below in Jane's 2009 Prairie Gothic collection (blogged here) the Simple Silhouettes include a Sugar Skull, Paradise Garden, Iron Cross and Bleeding Heart. Another thing we love about Jane's fabrics is that they are perfect for broderie perse, a technique in which motifs are cut from the fabrics and used directly in applique. Here is one cool valentine that illustrates the approach. The purple fronds that surround the heart are from Jane's Sunshine and Shadow line, which were fussy-cut and then appliqued around the heart; the cicadas in the upper corners were cut from another line. We love the red, pink and purple color scheme, the "subversive" tattoo-like stitching, and the spiky branches that emanate from the heart. 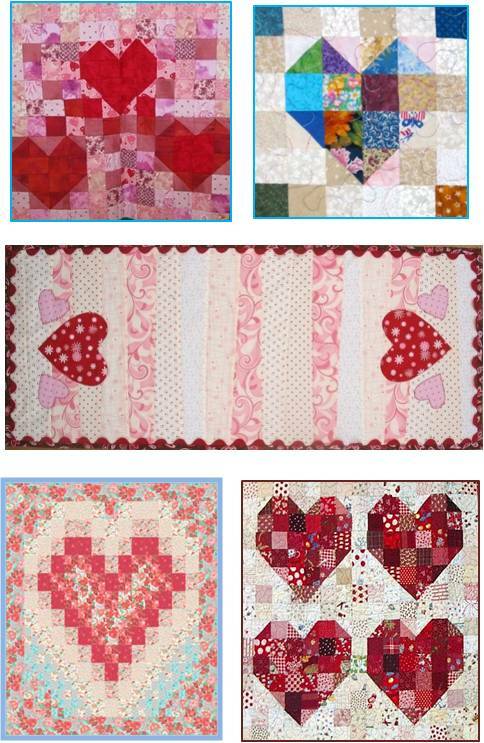 In addition to the wall-hanging-sized hearts shown above, here are two examples of bed quilts made from Jane's former Hothouse Garden and Paradise Garden lines. These quilts show just how effective her prints can be on a large scale (these free quilt patterns are still available at Jane's Idea Book). All of which brings us to Jane's newest fabric collection, Early Birds, which was released this fall by Free Spirit Fabrics (it's in stores now). Early Birds is an enchanted garden filled with Jane's familiar friends: dandelions, bleeding hearts, primroses and, of course, a clever critter or two. 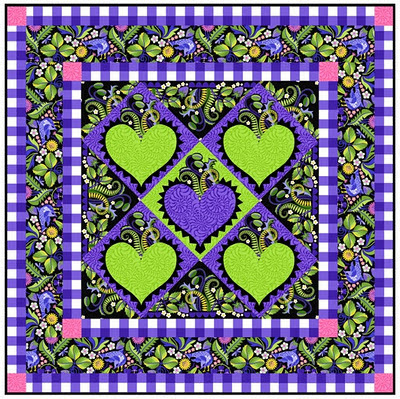 In the Early Birds quilt project, shown below, giant hearts are used to showcase the lime and plum-colored prints, which have a wonderful quilted appearance from afar. Last but not least, Jane Sassaman has a new book that is coming out this spring (published by Dragon Threads). 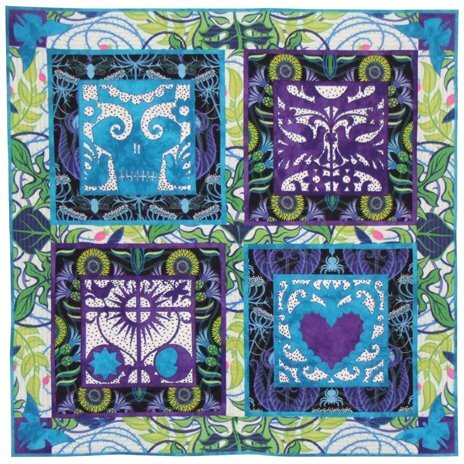 It is called "Patchwork Sassaman Style" and it is all about using big, bold and beautiful prints in quilts. The book will feature pieces made with her FreeSpirit fabrics, and one of her designs will also be available as a silk scarf (you can preview the images at Dragon Threads). Image credits: Images are shown with the generous permission of Jane Sassaman. For more information please visit her website at Jane Sassaman.com. 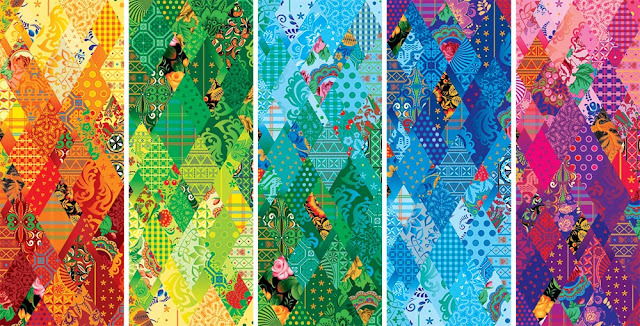 The 2014 Winter Games is in Sochi, Russia, and the theme is based on the patchwork quilt. 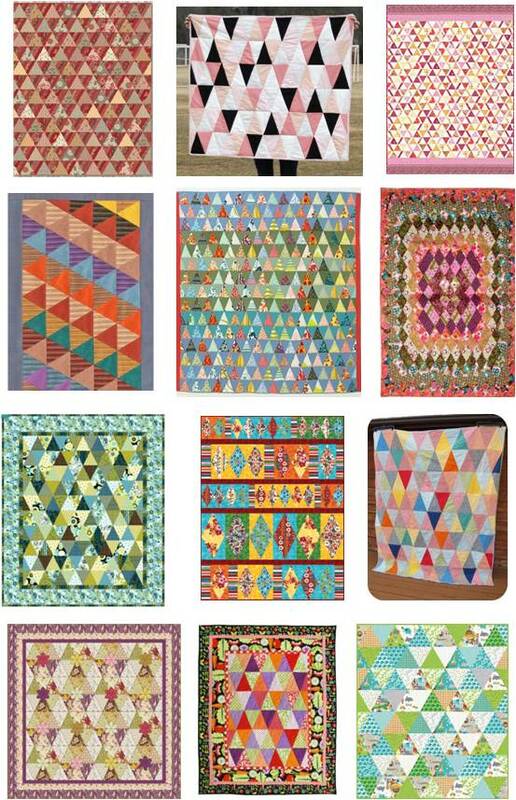 For free Thousand Pyramids and diamond quilt patterns, please see our updated (2016) free pattern day! We're wrapping up our Winter Quilts Series! Thanks to these remarkable artists, we've had a blast learning about all the different techniques that can be used to create snowflakes: reverse shadow trapunto, quick strip paper piecing, kaleidoscopes, Notan, sun printing and more. Here are all the quilts we've shown over the last two weeks, along with links to the original websites where you can find books, patterns, prints and other products. And now, it's time for us to move on to our next Free Pattern Day and a special featured artist. See you on Monday! Row 1: Snow Flurries by Peggy Martin at Peggy Martin Quilts; Flurries by Cheryl Wittmayer at Sew Be It; Snowflake Delight by Angie Padilla at Angie's Quilt Pattern Shop. Row 2: Winter Wonderland by Leah Day at Day Style Designs; Notan Snowflake by Nancy Schlegel at NRS Quilter as seen at the Fast Friday Fabric Challenge; Glistening Frost by Susan Varanka at Susan's Quilt Creations. Row 3: Kaleidoscopic XXII: Ice Crystals, c. 2000, Paula Nadelstern; Floating Mariner, block and quilt, by Jennifer Ofenstein at Sew Hooked. Row 4: Kaleidoscopic XXII: Ice Crystals, detail, c. 2000, Paula Nadelstern; Frosty Window by Sue Andrus at Andrus Gardens Quilts; Dancing Twilight by Cheryl Malkowski at Cheryl Rose Creations. It's Day 10 of our Winter Quilts Series! 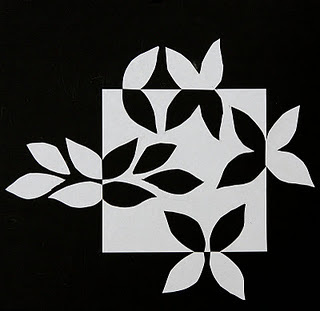 Most of our focus has been on pieced or appliqued snowflakes, but today's feature is about art quilting. Sue Andrus is a fabric artist whose works are inspired by flowers, gardens and nature. She creates pieces ranging from tiny quilted and beaded pins, to postcards, small quilts for framing, and larger wall hangings. She explains: "My quilts are like any piece of fine art, I just use a different medium. Instead of watercolors or oils, I use fabrics, fibers, and other things along with paints to create my pieces." We are fascinated by her Frosty Window. 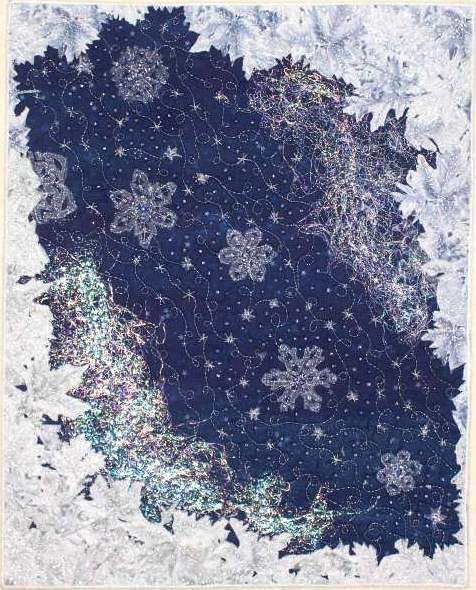 Sue Andrus explains this wonderful piece, which includes many elements of surface design: "I wanted this to represent a very cold snowstorm as seen through a frosty window. 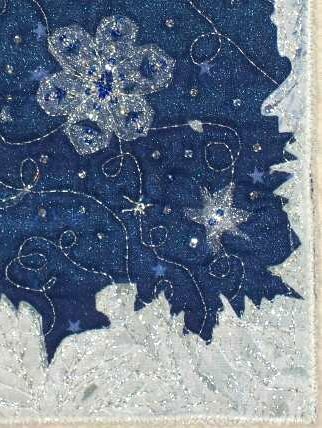 I used a fabric painted deep shimmery blue with sunprints of tiny star confetti and sea salt patterning that I thought looked like snow falling at night when I painted it. I had 2 pieces of a commercial print in white and pale blue with silver metallic enhanced leaves. I cut out the fabric to form the edges of frost on a window. I also added some shredded Mylar that I had for more shimmery frost. Snowflakes were cut out from Organza backed with Wonder Under, then fused to the quilt. 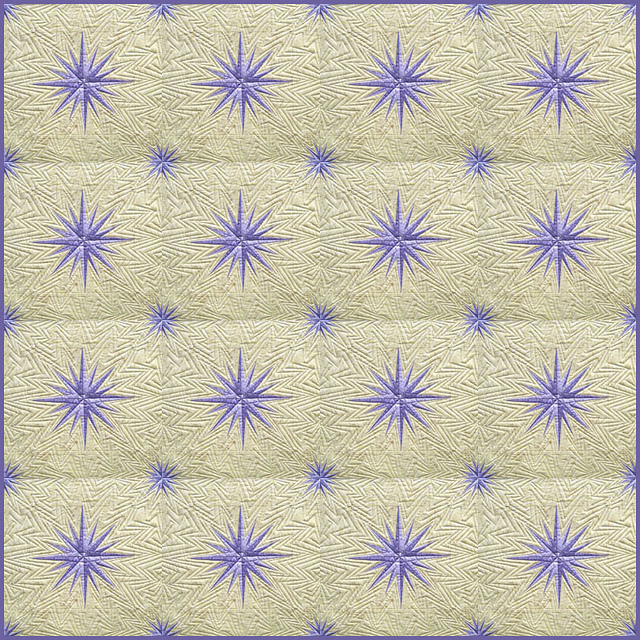 Quilting in silver metallic thread, and beading in the snowflakes and between the flakes and quilting were also added." 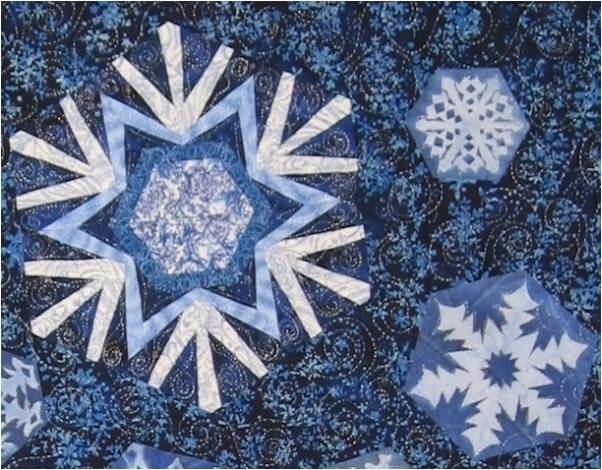 Here is a detail photo showing the beading on one of the snowflakes, and scattered between the quilting lines. It also shows the fabric used to give the look of the frost around the edges of the window. 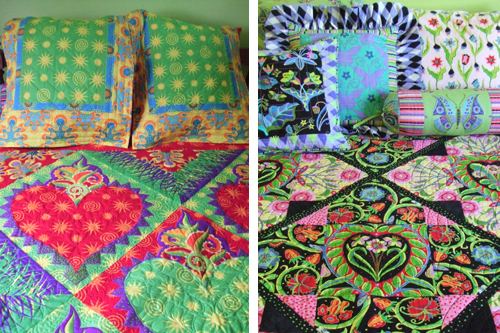 All of Sue Andrus' quilts are of her own designs. 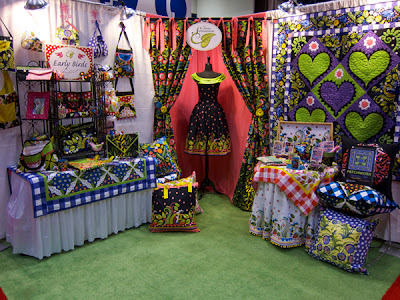 You can find her beautiful art quilts, gift items, hand printed fabrics and more at Andrus Gardens Designs at Artfire. Image credit: Images are shown with the generous permission of Sue Andrus. For more information, please visit the Andrus Gardens Quilts website, and for works in progress and inspiration see Sue's blog, My Quilted Gardens. It's Day 9 of our Winter Quilts Series! Have you ever looked through a kaleidoscope? When viewed through one end, a kaleidoscope displays a variety of beautiful colors and symmetric patterns as a result of mirrors that reflect the objects within the tube (the word "kaleidoscope" is derived from the Greek words meaning "beautiful form to see".) Paula Nadelstern has achieved international recognition for her innovative and complex designs inspired by the bilateral symmetry of kaleidoscopic images, including the American Folk Art Museum's first one person exhibition highlighting the work of a contemporary quilt artist (2009*). 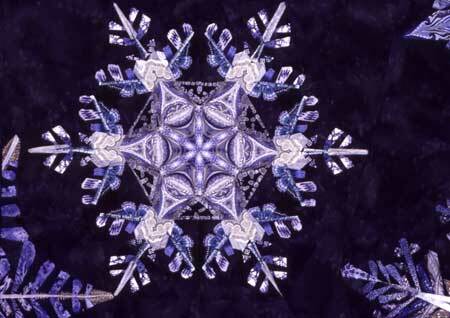 Her astonishing works of art include her precisely rendered Ice Crystals. The symmetry of a kaleidoscope image is a measure of how accurately the original interior image is reflected around the kaleidoscope interior; in a well-made system, there is a seamless continuity of the image sections, with the images matching up perfectly along the edge of each pie-shaped piece. Paula Nadelstern has experimented with different ways to piece the triangular wedges so that the patterns come together perfectly. She is the author of several books published by C&T Publishing that explain her process of pattern drafting, fabric selection, and piecing, including "Snowflakes & Quilts" (available as an e-book). 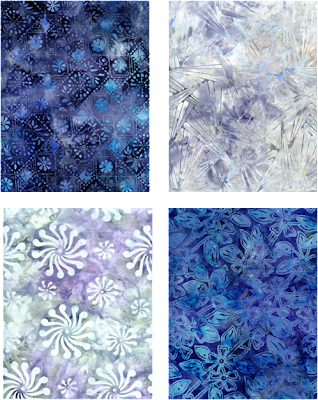 Last but not least, Paula designs sumptuous fabrics for Benartex - including printed panels - that can be used to create dazzling quilts with simple quilt patterns. Check out her gorgeous Patternista fabric line at Benartex. *Image credits and links: Images are shown with the generous permission of Paula Nadelstern. For a story about Paula Nadelstern and her snowflakes, see "A special gift--the legacy of Snowflake Bentley" by Barbara Eaglesham, The Evening Standard (London, England), December 1, 2002. A fantastic free, downloadable, full-color catalog of the exhibit, "Kaleidoscope Quilts: The Art of Paula Nadelstern", can be found at The American Folk Art Museum website. For information on Paula's upcoming exhibits and workshops, visit Paula Nadelstern's website. It's Day 8 of our Winter Quilts Series! 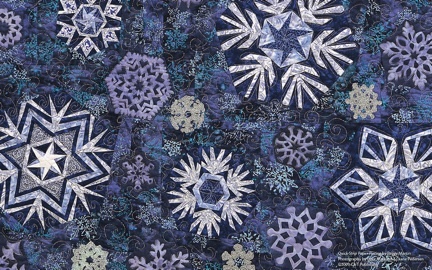 Intricate and innovative, the snowflakes on this quilt are created by paper-piecing and the sun-printing method. 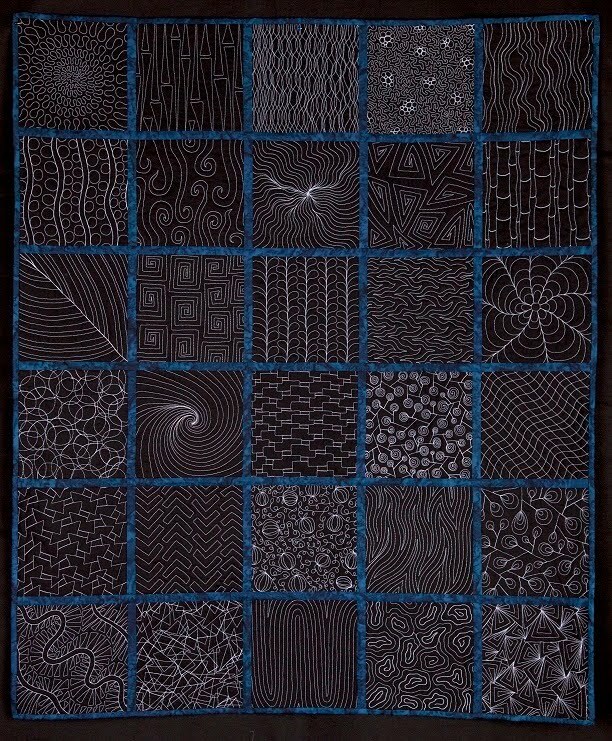 Let's take a look at how quilt artist Peggy Martin achieved these fascinating effects. 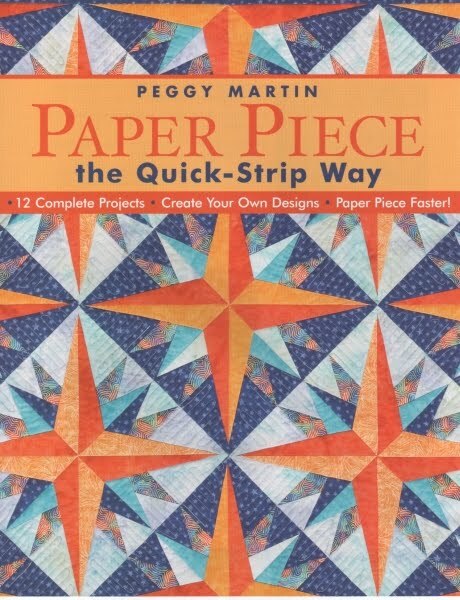 Peggy Martin is a very popular and internationally known artist, author, and teacher who was selected as the 2010 Quilting Teacher of the Year by The Professional Quilters Association. 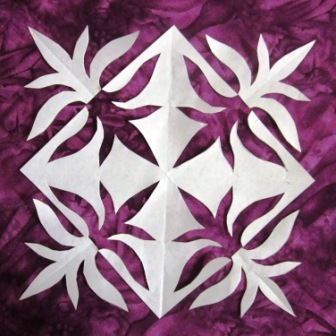 In "Snow Flurries", Peggy has constructed the three larger snowflakes with a paper-piecing method. Each snowflake consists of six pie-shaped blocks which are pieced together to all meet in the middle, creating a hexagon shape. The smaller snowflakes are created using a sun-printing technique. 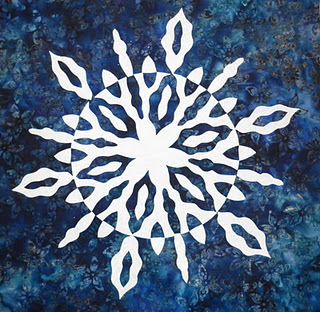 To make sun-printed snowflakes, take white fabric and paint it with Setacolor transparent fabric paint. While the paint is still wet, take a snowflake that you have cut out of freezer paper and finger-press it on top of the fabric. Allow the paint to dry in bright sunlight, then peel off the freezer paper, and there is your snowflake printed on the fabric! In a recent interview on the C and T Publishing Blog, Peggy says," I began making quilts for my home, mainly in blues and burgundies. Now I enjoy exploring as many different color combinations as possible and playing with the interaction of colors in different ways in my newer quilts." 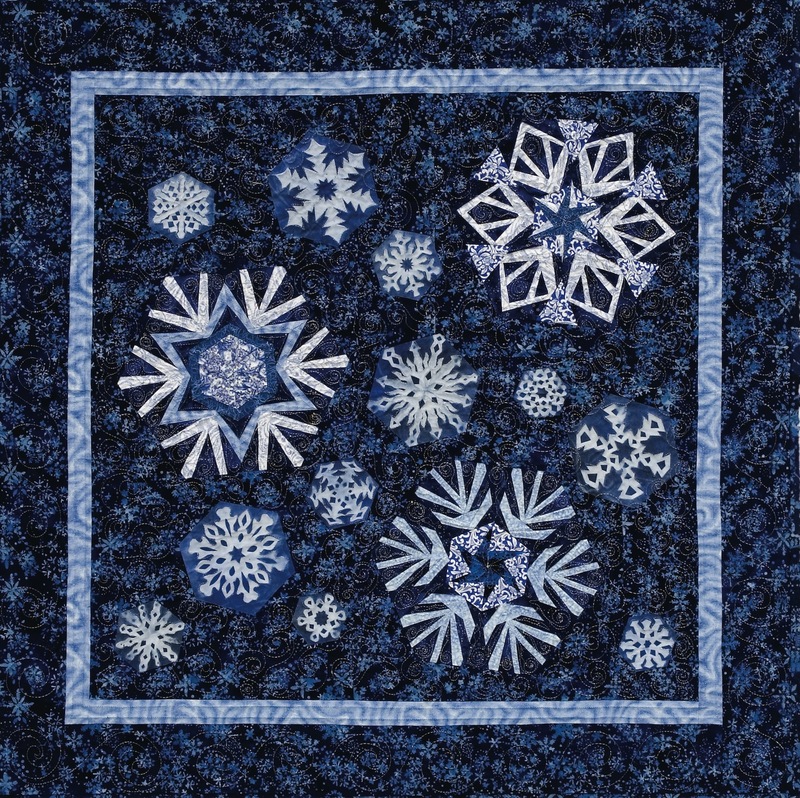 The bright navy background and icy chambray blue colors here make a lovely monochromatic combination, but there are many colorways options for these snowflakes. For example, this quilt would look very pretty done with a clear bright pink background, lime green inner border, and white snowflakes for a little girl's room. Peggy has used her artistic talent to develop forms and shapes which twinkle and sparkle so much that they almost jump off the computer screen. 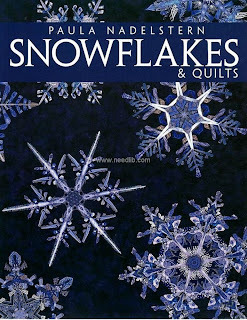 These snowflakes against the deep blue background also remind us of beautiful stars on a cold, clear, winter night. We own a copy of this book, and we cannot say enough good things about its content, organization, quilt ideas, and great writing ! We strongly recommend it, as it is full of useful instructions and dazzling projects. 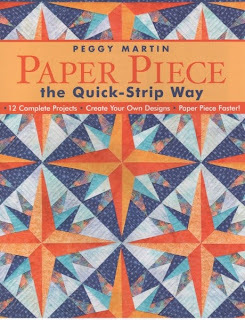 ﻿ Also, you can learn Quick-Strip Paper Piecing from Peggy Martin in her new online workshop at Craftsy. Image credits: Images are shown with the generous permission of Peggy Martin. 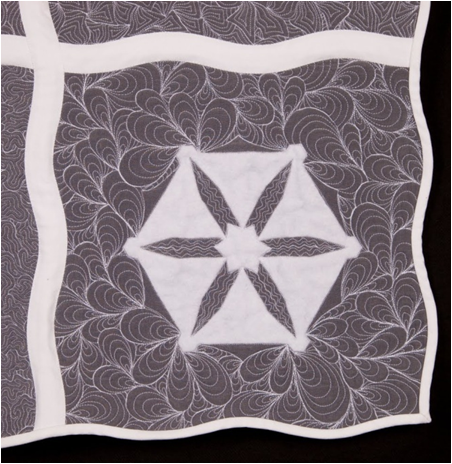 We previously featured her award-winning Eye of the Storm quilt in our series on Storm at Sea. It's Day 7 of our Winter Quilts Series! We first came across this starry quilt two years ago. Based on the Dancing Twilight pattern by Cheryl Malkowski, the lap size version of this quilt was featured by Timeless Treasures in two colorways: "Fire" and "Ice". Cheryl describes the quilt as "one of the easiest quilts you'll ever make". Here is the icy version. 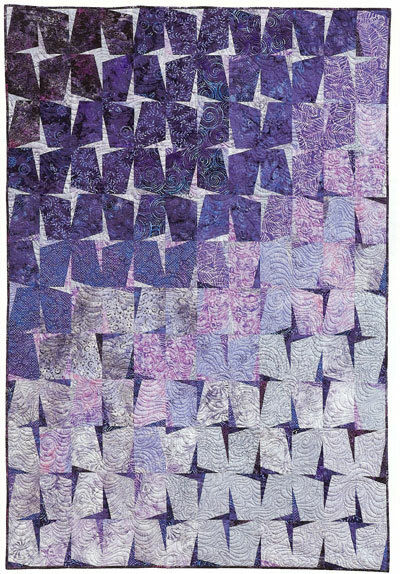 For more inspiration, you can see a beautiful purple version of the Dancing Twilight quilt by Capitola Quilter at Flickr. Image credits: The image of Dancing Twilight is shown with the generous permission of Cheryl Malkowski. She is the author of several books published by C&T Publishing, including Fun With One Block Quilts. Her quilts are rich in texture and movement, but simple to make. It's Day 6 of our Winter Quilts series! From high up in the Andes mountains, in the city of Quito, Ecuador, Angie Padilla runs her own international business: Angie's Quilt Pattern Shop. Her highly original designs are rich in applique work, such as her magnificent Christmas Dove, which we featured in Christmas Around the World. 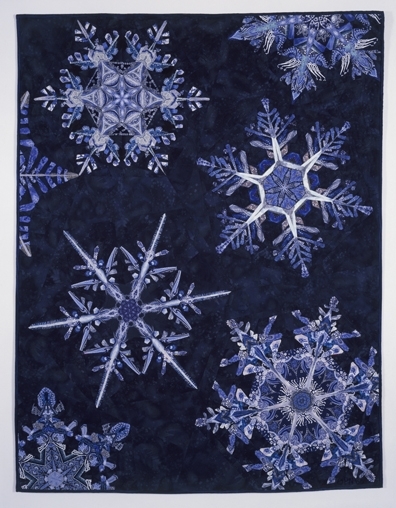 We are equally taken with the ornate snowflakes in "Snowflake Delight". 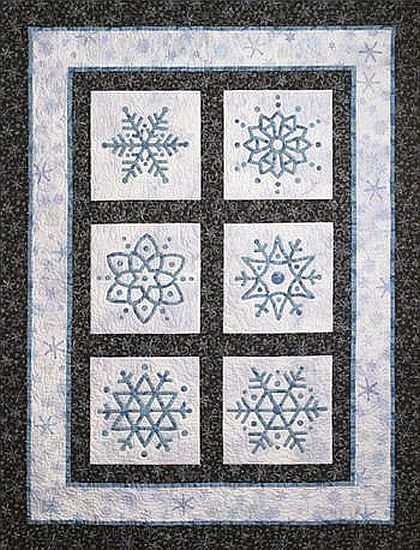 In this beautiful lap quilt there are four different delicate snowflakes; you can use your favorite one for all four blocks or sew all four for a stunning quilt. The use of two colors really makes the snowflakes stand out against the peaceful blue background. Angie's delightful patterns can be found at Angie's Quilt Pattern Shop and you can read about Snowflake Delight on this page. Image credits: Images are shown with the generous permission of Angie Padilla. She is an Electric Quilt (EQ) expert and the designer of My Dream House, an EQ CD that allows you to create your own dream house with over 450 different pieces. Would you like to create your own applique designs in EQ? You can learn how with Angie's Applique Drawing Book. It's Day 5 of our Winter Quilts series! 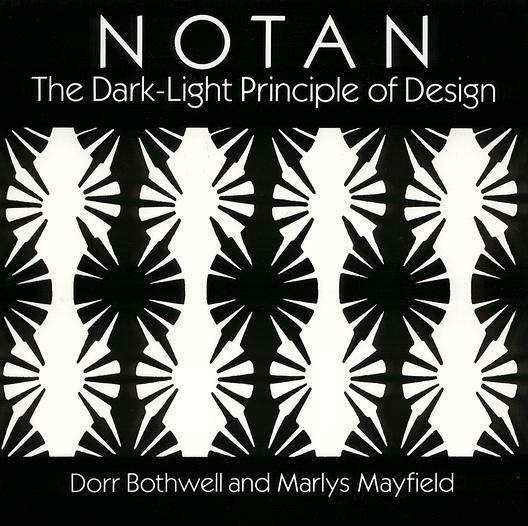 We're here to talk about the concept of dark/light harmony ("Notan") in art and quilting. 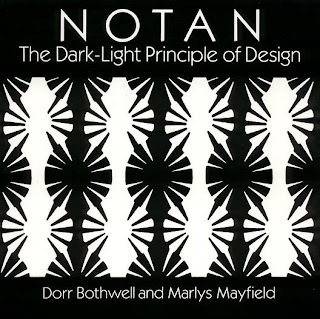 Notan refers to a well organized arrangement of dark and light shapes which creates an impression of beauty, regardless of either the colors used or of the subject matter (see this article). In addition to experiments with negative space, Notan can be the starting point for quilt blocks, embroideries, or images to be printed. This lovely snowflake was created by fiber artist Nancy Schlegel as part of a 2011 Notan Challenge. 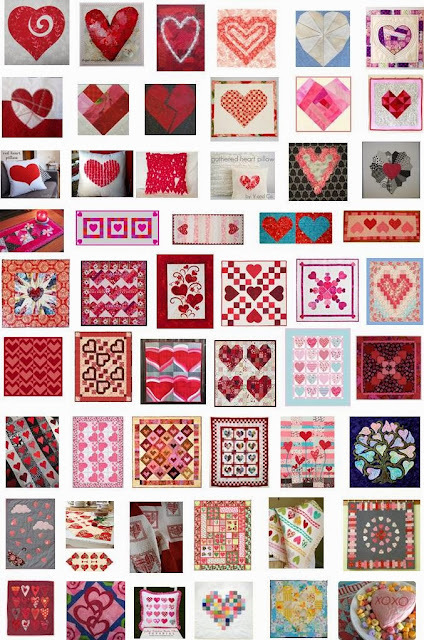 The 2011 Notan quilt challenge actually began with Cathy Miller, aka The Singing Quilter. Here is a Cathy Miller design (below). The block was placed on point as described at this post. 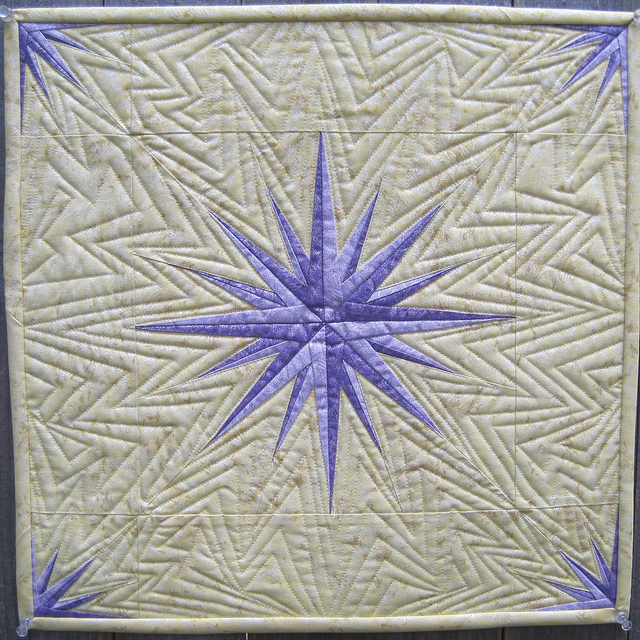 You can see a whole gallery of Notan challenge blocks at The Singing Quilter's Facebook page. It's Day 4 of our Winter Quilts Series! We're excited about today's stunning quilt by Leah Day of Free Motion Quilting Project fame. Let's explore a winter wonderland of gorgeous snowflakes along with a clever technique for snowflake construction. This quilt won Best Machine Workmanship at the AQS Quilt Show & Contest 2011 in Knoxville, TN. Leah says: "This wall hanging quilt looks intricate and advanced, when in actuality, any quilter could make it!" 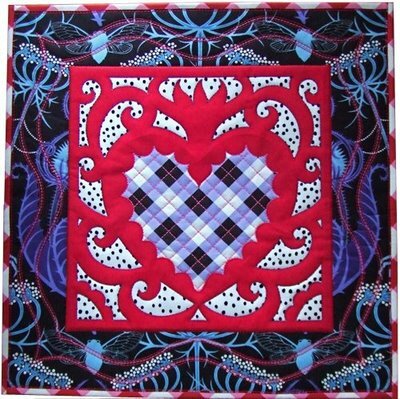 At The Free Motion Quilting Project you can find 365 *free* FMQ designs. For more information on Leah Day and the Project see Frequently Asked Questions and Start Here. Leah's instructional DVDs and other supplies can be found at the Day Style Designs Quilt Shop. Image credits and links: Images are shown with the generous permission of Day Style Designs. 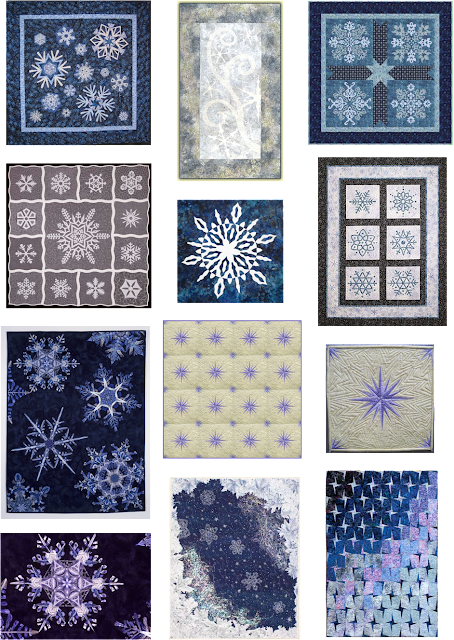 You can read the fascinating story of the snowflake quilt at Leah's blog: Winter Wonderland Part 1, Winter Wonderland Part 2, Winter Wonderland - Finished, and Whoo Hoo for Winter Wonderland. It's Day 3 of our Winter Quilts series! 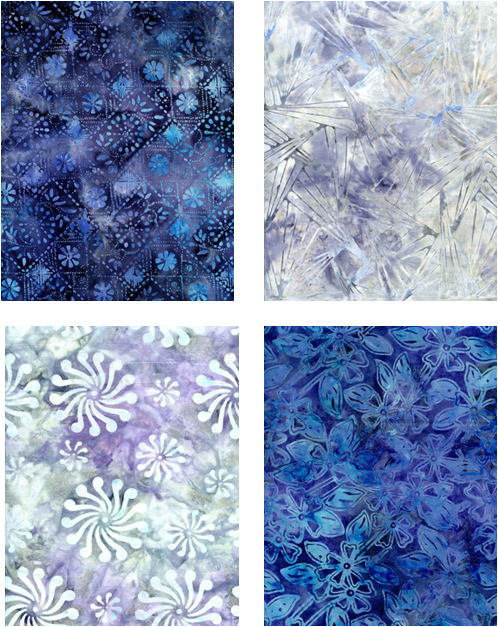 Here's a fun and creative way to construct a quilt with a snow and ice theme. 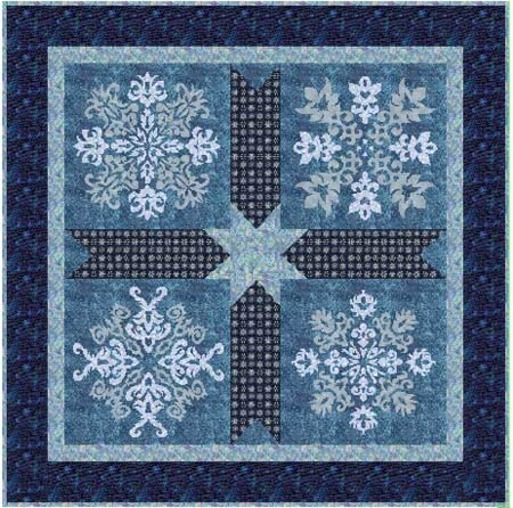 You can use straight and bias strips to applique graceful, elegant snowflake designs. 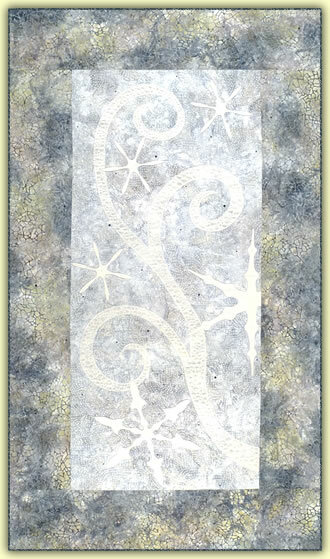 Susan's Glistening Frost pattern features beautiful Celtic style symmetrical designs with a twist. Depict any season or theme that you wish. Included are directions for stamping to create your own fabric and enhance your theme as shown in the light border. We really liked the versatility of this quilt design because it can be sewn in such a variety of colorways and fabrics for so many different rooms in your home. For example, think of decorating an infant's room, in soft, winter colors of icy sage green and lilac snowflakes, surrounded by a glittery yellow maize border, in Michael Miller's "Fairy Frost" fabrics. Or, you could join three or four blocks in a straight row, with an emerald or aqua green background decorated with snowflakes in fuchsia or red Bali fabrics. These complementary colors would make a stunning holiday table runner. In addition, a beautiful wall hanging could be created for a contemporary family room or dining room by using midnight black background fabric, appliqued with metallic silver or metallic gold snowflakes. 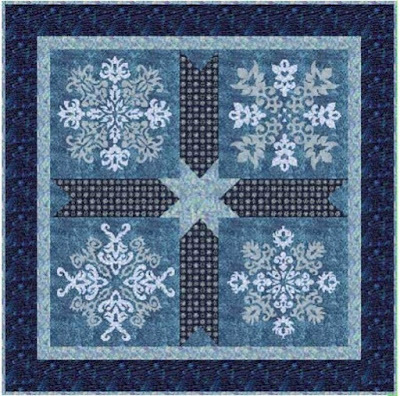 What are some color combinations and fabric types for this snowflake quilt that you might create for your own home? Use your imagination and let us know in the comments below ! We'd love to hear your ideas and inspiration. It's Day 2 of our snow, ice and winter stars series! We're sew excited to share this Sew Hooked design, which was created by paper-piecing wizard Jennifer Ofenstein of Sew Hooked fame. "Floating Mariner" is Jennifer's stunning version of a traditional Mariner’s Compass Star. This quilt reminds us of twinkling stars reflecting off a blanket of snow. 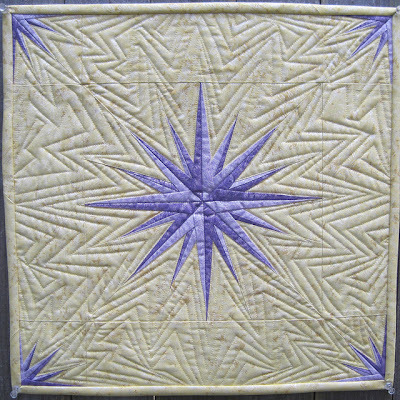 We love the way in which the smaller stars in the corners of the blocks come together to echo the center motif. The photo above shows a 4x4 block arrangement; a single block makes a stunning 15.5″ wall-hanging (below). The detail photo below also shows Jennifer's lovely echo quilting. You can read about the Floating Mariner at this post and obtain the pattern for only $6 at the Sew Hooked Shop. Jennifer says: "The block is simple enough for an advanced beginner to tackle, but rewarding for quilters of all skill levels." Want to learn to paper piece? It's easier than you might think! Check out Jennifer's free paper piecing resources and text tutorial. Image credits: Images are shown with the generous permission of Jennifer Ofenstein. Winter brings to mind snow, ice, and deep starry nights. Some parts of the world have already seen snow this year, while others will soon be watching snowy white flakes drift from the sky. You may have heard that no two snowflakes are alike, but did you know that snowflakes can have one of about 35 different shapes? 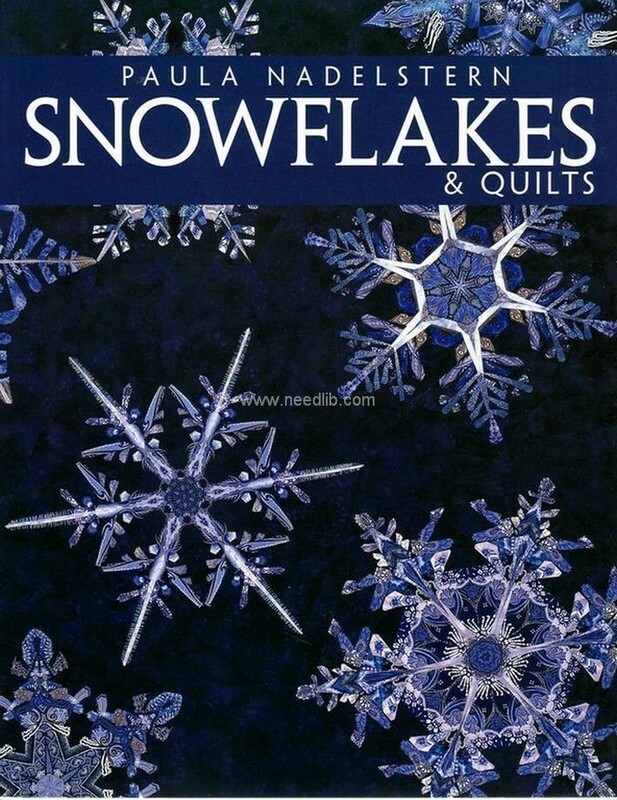 And did you also know that there are many ways of depicting snowflakes in fabric? 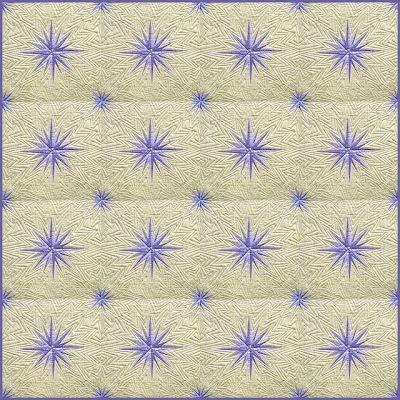 Join us as we take a look at some sparkling winter quilts and interesting techniques. 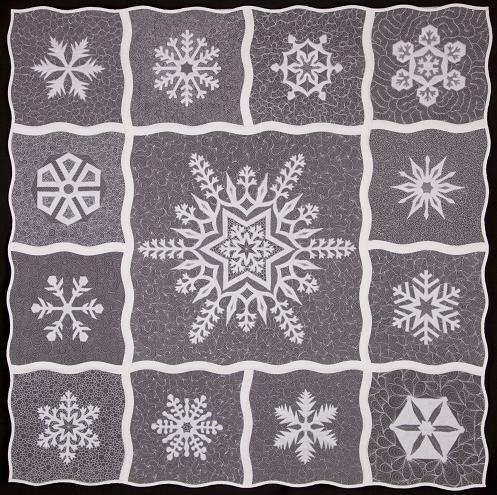 This elegant wall hanging brings a wintry day to mind with a flurry of wind and a handful of snowflakes done in white and shades of gray. We love the cool colors. In her description of the "Flurries" pattern, Cheryl says: "Now you can treat yourself to a crisp, wintery blast without snow-blowing the driveway in a blizzard!" The simple elements are applied with fusible applique with cotton or wool felt. And if you're feeling nostalgic, embellish with Swarovski crystals. Cheryl Wittmayer makes her home in beautiful Billings, Montana which has 205 sunny days per year... along with 57 inches of snow. Image credits: The image is shown with the generous permission of Cheryl Wittmayer. Many of her quilting patterns have won awards at art, fiber, and quilt shows. 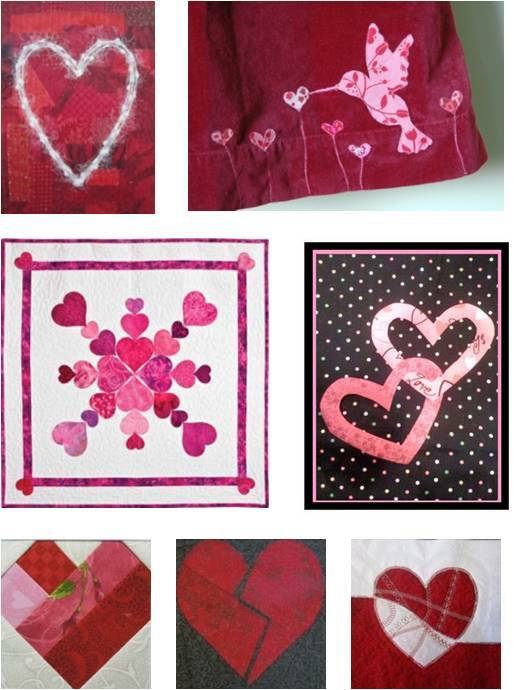 Her extensive line of easy and artistic patterns can be found online at Sew Be It. There is something marvelous about Valentine's Day, and about hearts anytime. This post has been updated; please check out the latest collection of 50+ free patterns at Free Pattern Day: Hearts and Valentines. Image credits and links: All images are copyrighted by their owners. Please respect their generosity in sharing their free patterns, and the restrictions they have placed on the use of these designs. The photo montages are the property of Quilt Inspiration. 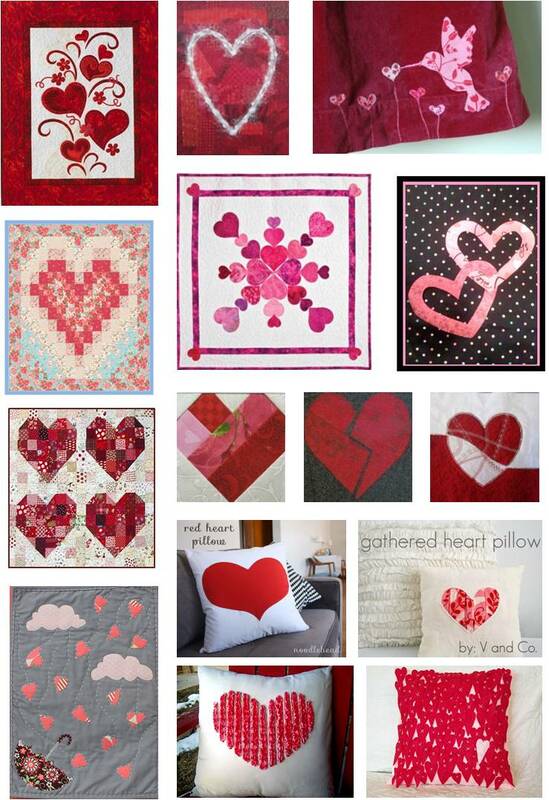 There is something marvelous about Valentine's Day, and about hearts anytime. We have updated this original post; please check out the collection of 50+ free patterns at Free Pattern Day: Hearts and Valentines. Image credits: All images are copyrighted by their owners. Please respect their generosity in sharing their free patterns, and the restrictions they have placed on the use of these designs. The photo montage shown above is the property of Quilt Inspiration. Pin freely but do not post to any other site.